A super healthy roasted tomato soup which is super comfort food all the year round. Even if you don’t like soups, give this a try. 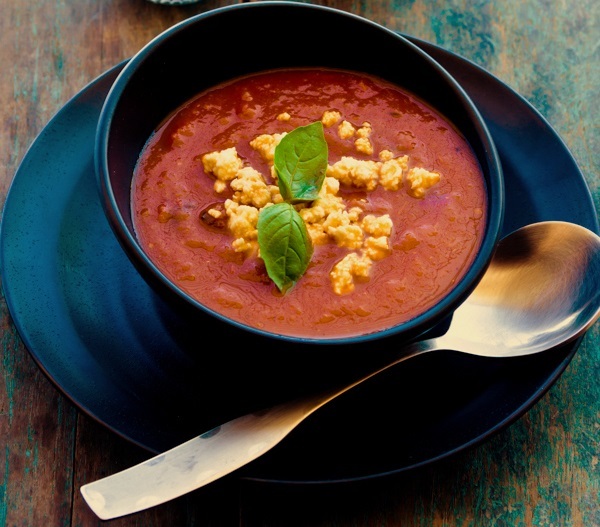 This classic tomato soup recipe is the perfect recipe to whip up on a cold evening, for a starter at a dinner party or special occasions, or maybe you just fancy a lighter dinner than usual but still want lots of nutrients. Packed with fresh tomatoes, not only is this a quick soup recipe, it's healthy and filling too. Not only that, but the kids are guaranteed to love it - who doesn't like classic tomato soup? So easy to make that we dare say, you'll never buy tinned tomato soup again. Cut the tomatoes in half and place each half on a baking sheet facing cut side up. Drizzle the vinegar and 2 tablespoons of olive oil over the cut tomatoes. Then sprinkle salt and pepper to taste. Flip the tomatoes over to put the cut side down and roast in the preheated oven for 30 to 40 minutes or until the tomatoes have charred on the edges and turned mushy. Heat remaining olive oil in a medium saucepan. Tip in the chopped onion and minced garlic and saute them until translucent and golden brown. Add the flour and stir constantly to avoid burning. Flour will thicken the soup and give a nice texture. Then add the roasted tomatoes and stir them breaking down any bigger pieces. Saute the tomatoes for 5 to 8 minutes. Now add the vegetable stock and bring to boil. At this point you can also add half of the chopped basil leaves retaining the rest for garnish. Let the soup boil for 5 minutes on medium-low flame. Season it with salt and pepper to taste. After good five minutes of boil, it’s time to blend the soup. You can either blend the soup in the cooking pot itself by using a stick blender or transfer the content into a jug blender and blend until silky smooth. After blending, warm up the soup again in the same pot and once it reaches to your desired consistency, switch off the flame. Serve the soup hot with some grated cottage cheese or crunchy croutons on top and few sprinkles of freshly chopped basil leaves.